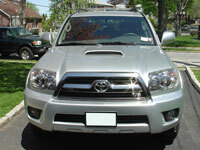 The 2006 and 2007 Sport Edition 4Runners come equipped with a smoked chrome grill. It is indeed a nice new touch, but not my preference. 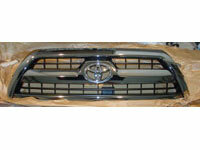 My 1999 4Runner Highlander came equipped with a body color grill, which I liked alot. 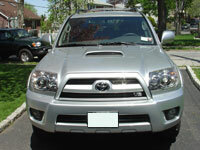 The 2006 and 2007 4Runner Limiteds have a body colored grill also. Being that the grill is basically the only chrome item on the vehicle, I decided to purchase a factory grill made for the 2007 Limited version of the 4Runner which comes pre-painted and ready to install. There are 8 nuts that hold the grill to the hood and need to be removed to begin installation. After removing the 8 nuts, and before removing the grill, you need to disconnect the hood catch rod where it connects to the hood catch release lever assembly. Then remove the grill and bolt in the new one. If you have the V-8 emblem on your original grill it simply unhooks from the rear and attaches to the new grill.